If lots of those 670 applications were fit for the job, then I don’t want to hear about the talent shortage. If most of them are totally wrong for the job, then HR has screwed up in its job description. If whole bunches of people walk into your shoe store looking for tires, you might have an identity problem. Once you have a decent job post, I’d be fine with a person (not a robot) dropping totally off the wall applications into the recycle bin. Judging from those people who wonder why they don’t get responses after sending out 1,000 resumes there will always be applications like this. But I doubt anyone would get sued for sending back something saying the cover letter was funny. Dogs, as far as I’m aware, are not a protected class. @Scott: That’s the point. No HR dept that I know checks how many applications it took to fill one job. A ratio of 670:1 suggests they’re doing it all wrong. LinkedIn keeps sending me a job listing for a specific company and asking me to be “one of the early applicants.” It’s been posted for a while now. I was recently at the facility where the job is posted….talking to the people there about projects they have that my employer might supply equipment for. Last year, a couple of their employees spent a lot of time at my facility doing some R&D work with us. I’m half tempted to apply for the job and see if I get a canned rejection letter because I don’t have all the “boxes checked”, at least according to LinkedIn. I’d bet good money that I would. Computers. Internet. Big data. AI. Digital. These buzzwords get people really excited, and before they know what they are doing they start using them. This is a problem. Artificial intelligence (AI) is the latest buzzword just making the business community go bananas. Oh yes! Don’t forget machine learning. Like any too AI and machine learning need to be applied with caution. Using AI to recruit humans is like giving a power saw to someone without instructions and finger guards. You end up injuring yourself and other people. If I was treated badly by a company I applied to, I do not do business with them. “Intelligent agents” will find you a job. I don’t understand this “talent shortage” myth. I’m single because I’m an unattractive jerk who doesn’t put any effort into finding a date. It’s not because there’s some mystifying shortage of attractive, eligible partners. The idea that there aren’t enough people out there who are not only good enough for me, but also willing to do all the work of coming to me and trying to win me over, is one of the most egotistical and childish excuses I could muster up. Nobody would believe that, nobody should believe it, and nobody should have a favorable opinion of me if I seriously tried to make that claim. a lot of difficulty. Another problem is co rep in a particular geography. to come in for lunch. Co adds and outreach would go completely unanswered. hot tech market. You want to give them a 15% raise and or sign on bonus?!!!! That, or “We’re really only looking for cheap foreign labor”. My first observation is, at least he got a response. But beyond that, for years employers have complained they can’t find the people. For years I’ve listen to this and thought, “why does that sound familiar?” I finally know why. The evaluation processes many businesses use to evaluate potential employees remind me evaluating a piece of equipment for a manufacturing process I’ve been involved with. 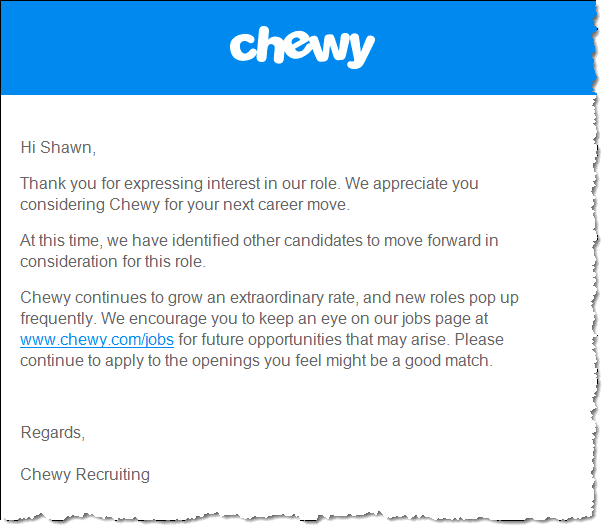 In Chewy’s response, notice that the job had already been filled. So they were taking applications for a filled job. Chewy doesn’t use the resumes they have in their ATS. There are a couple of “cattle call” opportunites in Boston that are being hawked by every recruiter covering the Boston area. I’ve been told the cattle call was sent to the staffing firms by Chewy. If you were hiring for these positions a few months ago, why not check your ATS first? One more thing regarding Boston: If the position is “filled…” Go search for the position again. 90+ percent of the time, they’ve reposted the opening. I see this over and over again, for years on end. I wrote the cover letter. After dozens and dozens of my job applications had been given the silent treatment, I decided: if I want a different result, I need a different approach. I stopped writing cover letters that started with “I’m an award-winning copywriter with 20 years experience…” I needed to SHOW my clutter-shattering, conceptual chops. Getting this rejection letter was such a relief! I suddenly felt less bad that my credentials had been ignored. I stopped applying for jobs entirely through job boards. I now do research-gymnastics to find some human somewhere who knows someone who can physically walk my resume into HR. The bright side of all this is realizing that relying on fellow humans will always be better than putting faith in job boards. So… just maybe we won’t all be replace by robots. For those who fear robots, remember this: Those robots have to be paid for. If everyone loses their job to robots, they will not have money with which to buy things made by robots. Then not as many robots will exist. Automation is great, but somebody has to pay for it. @Kevin: Automation is not great when it’s used to make choices based on complex criteria. Job boards have been selling HR a bill of goods for years because personnel jockeys (in general, not all) are to embarrassed to admit they know nothing about database technology — they just pay for it. Well played, and you are spot on with the research gymnastics, but bypass HR, and get the credentials into the hands of the line manager who has a problem to solve, they will respond. The problem is dealing with HR at all. You need to go around them if you want to stand a chance. I teach all of my clients that once they complete their application (because you want to show you can follow their rules) the next thing they need to do is network to find a way to the hiring manager. If that does not come true, you can certainly find someone in the management chain for that position. Then mail that person your resume and cover letter. That way at least you get it into someone’s hands in the department you want to work for, and it gives you good reason to reach out and contact them. Unless of course the job was already filled by someone who came in as a referral. Over the past month, my phone has been ringing from 8 AM to 6 PM, daily. The primary problem I’m seeing from employers is intransigence in this so-called candidate’s market. I have been thinking about the relationship between a “mission” and an “agenda”. It is apparent that HR has an “agenda” but no “mission”. They can certainly “articulate” their agenda. There is no evidence that their “agenda” is supporting the success of their organization’s “mission”. Agendas are subordinate to the mission, Missions come first. @Peg. You and I may disagree about what that agenda is or might be, but I fully agree that HR has an agenda. Both HR and corporations are very vocal about it. It is such the “Elephant in the Room” that everybody is afraid to talk about that I can’t even name it here in this friendly forum. This is so canned. Even the compliment is canned. So even the introduction have no thought behind them. @Lucille: A good response is to ask the “recruiter” to explain how they think you could apply your specific skills to do the job, THEN you’ll talk to them. This has happened to me a few times before…someone calls me and says “We got your resume online” (recruiters almost exclusively, since the job often didn’t fit me at all, and they were just trying to “shoehorn” people into it). Most recently, I heard “You were referred to us”. And when I asked “Who referred me to you? What about my background attracted you to me?”, then the old Ralph Kramden “Hamina, hamina, hamina” came out…I never did learn who allegedly referred me. HR doesn’t fill positions because they don’t want to fill positions. They want to act like they are doing something. It is all about looking busy, while they pass out money to recruiter, temp agencies, and headhunters. I recently took they buyout from Verizon (another HR boondoggle), and have been in the market for 3 months now. I cannot count how many companies I have had an interview thru a recruiter when the company already had my resume in their database. In many cases, I had even applied for that specific position! And not small companies, (Harris, Motorola, Centurylink, Ericsson, DISH, many more). The company ends up doing the interview, the recruiter seems to do nothing but present a resume and collect money. HR has too much control over the process, are spending money that they don’t need to, and aren’t accomplishing anything but keeping good candidates out of their company. Let the hiring managers select the candidates! I’ve worked with and been an internal recruiter. Many of the internal recruiters I worked with over the years strongly believed that the recruiting function and processes should not be in HR. That it merited a direct reporting line into the CEO. Sounds impractical? Not when you think about it. For instance..I was a QA guy much of my career. It’s common in the Corporate world to hear and read a company claim that Quality is key…important. 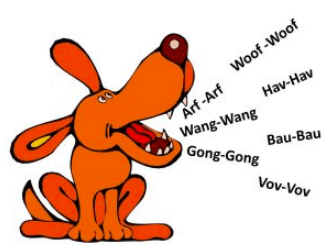 blah blah blah. Words. When you look at org charts you’d see that the QA function was buried in manufacturing or engineering or some other place…with the CEO buffered from the QA Stuff. Action speaks louder than words. similarly, t’s even more common to find claims that “people are our most important asset” blab blah blah..the very core need of this seemingly key asset is finding them, convincing them to invest their time with the company..Without that, it’s all moot. When you think about this…you’ll realize that HR the organization, takes a hand off to develop and maximize the value add new hire…after found. The value is found by the hiring manager & done right, who team plays with his/her talent scouts..recruiters (or they do the finding themselves). Same scenario as the QA example…top management puts a buffer in their organization keeping some distance between themselves & these seemingly important operations. Employer/HR complaints about dealing with volume is a self fulfilling prophesy. Shotgunning their needs into job boards & doing business by computer (my app will look at your e-resume) just invites inundation. And no,… an exacting job description if it exists, won’t dampen response. 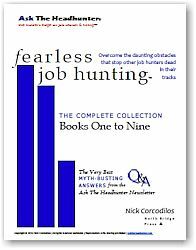 Job hunters that are primarily seeking opportunity via electronic means, play the odds and apply to about anything regardless of descriptions. How could it work otherwise? Suppose you reverse engineered the process starting with a process strong on civility and built on personal touch. for instance, that you have a standard requirement that each candidate MUST be respected with a personal and no BS response and application status. How can you do that with hundreds or thousands? Don’t use a process that generates hundreds or thousands of applications Suppose you did have a small recruiting arm, reporting to the CEO, who saw their role as finding good people for the company and the hiring managers, not effecting an assembly line of processing job applications. That also saw their role as being the networking arm of the company, building and maintaining networking pipelines that focused on meeting people. Time consuming, but focused work that dealt with developing and vetting pools of manageable #s of people with high potential.& facilitating their contact with hiring managers & vs versa..a manageable # of people you could respectfully deal with? This isn’t hypothetical. I had the experience of being an internal recruiter preceding the existence of HR, (alas only for awhile)..Of finding and vetting job hunting networks, job fairs that proved their worth to the point where we had the hiring managers on the floor not seat warmers collecting resumes, where we recruiters made a point of tracking and responding to each applicant. Not a perfect system and a work in progress but much better than automated processes…ah then an HR organization was formed and we went with an ATS, and things got more hands off. But my point..is I’ve seen elements of high priority hiring, high management involvement, applicant respect, and it’s so much better than inundating the organization with a volume that just effected an approach that only by ignoring applicants or looking for the magic key words that spell no risk success and which doesn’t exist. It can be done, but you’ve got to do as the saying goes, think outside of the box. And old habits die hard, both from the employer and job hunters side of the table. @Don Harkness: “I also spent most of my working life in IT. And I agree with one of my early bosses who wisely observed, “everything doesn’t need to be computerized”…and one of those things…is recruiting.” That sums it up perfectly. Computers are great, and can make doing many jobs easier, but some jobs shouldn’t be computerized. You also hinted at another problem: that no one wants to take the risk of hiring someone, no matter how badly the position needs to be filled. I don’t get it. Since when is anything in life risk free? HR could hire the perfect candidate according to their ATS, and then find that the guy lied, or is lazy, or can’t do the job. No one wants to bother with applicants anymore. Even job fairs have become a waste of time. Why bother to send an employee to a job fair if all he’s going to do is tell you to go to the company’s website and apply online. Most don’t even bother to look up from their phones, and won’t even take your résumé. Additionally, they can’t even tell you about available jobs, or what they entail. I was watching the news this weekend and two businessmen were complaining about the “talent shortage” and the “skills gap”. Several big employers in my area are closing and laying off workers. But apparently none of these people are qualified. When the job descriptions are so general or they require you to meet 99 specs, then I wonder whether the jobs are fake, written and posted to give HR busy work and something to complain to the C Suite about. I usually don’t hint at it. Recruiting and hiring is all about risk management…People rage about HR not getting back etc. I saw it as a job hunter, an agency recruiter and it used to drive me nots. When you’re inside…you see why…the much sought out hiring manager is indecisive…because they are risk adverse…So they keep looking, looking etc. Others are like greased lightening. There is no perfect, risk free hire. 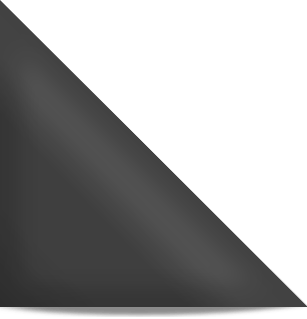 Computerization….is the perfect tool for the risk adverse. Create perfect description of a purple squirrel, dump it into the system..and you have the perfect process for the risk adverse. NO decision need be made. Add lack of accountability for hiring and you have stagnation. I think you and Mary Bath are quite correct on the risk adverse nature of people when it comes to hiring. Secondly, I’ve noticed a lot of complaints about how it’s hard to interview and hire, but then don’t spend enough resources to actually implement a robust hiring process. It seems to me that most “recruiting” is simply posting a job publicly (or spamming it to enough people), get a pile of applications, select a few of those applications with an arbitrary amount of keyword matches and experience and then call them in for an interview, where they will be asked “what is your greatest weakness.” Then any decisions will be based on “gut feelings” on whether the person is a “cultural fit” which is code words for “I’d totally go out for beers with this person after work”. Of course, anyone with half a brain knows that this process is generally rife with false positives/negatives, and there have been studies in IO Psych over the past century that show that unstructured interviews, years of education/experience and references do not correlate strongly with on the job performance. Whereas, the closer the job spec/interview is closer to actually doing the job, the better the results. There are several threads over on Reddit, for example, where so called recruiters, HR folk and managers will fight you on this point, even though actual data shows otherwise. @David: “a robust hiring process” is not in the HR lexicon. “A pipeline of 2 million resumes” is. HR is paying for an ATS to store/file what’s coming through the pipeline. They are already sitting on a pile of resume’s. Why not just turn the spigot off, and contact the people you already have in your pile. In other words, if you fill a position you likely had people that were runners up and could have done the job nearly as well as the person you hired. When you have another opening for the same role in a year or two, why not call those people and give them first crack at the job before you pay money for yet another job advert and waste time (we know time = money) screening a new batch of people. Or worse yet, you engage so called 3rd party recruiters/head hunters who present the same people already in your database. I’ve had stuff like this happen to me before, I apply directly/interview for job X, don’t get it, then two years later, have an agency come knocking and asking if I’m interested in applying for job X.
I’m not necessarily sticking up for ATS usage here, just so we’re clear. @David: Re your question about why HR doesn’t turn the spigot off, I may have an answer. I’ve had more than a few HR staff members in different professions and different companies/agencies tell me that they never keep “old” résumés or applications. If an earlier posting of a job didn’t generate a hire, they don’t go back to other candidates, they post the job again and start from scratch. If they did hire someone but he didn’t work out, or he left to take a better job/got promoted, they post the job again and start over. I asked why not look at the previous applicants, especially if it hadn’t been too long since they applied, and HR was horrified. They assumed that if those people were any good, they’d already be employed and no longer interested in this job, and if they weren’t employed after a month, a week, two months, then HR wanted nothing to do with them. Better to start over, and if the people who applied before are still interested, then they can reapply. I doubt if HR would even notice whether some applicants were repeat applicants. Back in the day when you filled out an application form or submitted a paper résumé, I remember seeing files of them. After a while (a year or more) they were cleaned out and thrown away, but many places where I worked kept the paper applications for a period of time, and they’d go back to them if a hire didn’t work out or their first choice turned down the job. Then again, back then there was no internet, no ATS, and most employers didn’t advertise jobs outside of the local area unless they big employers and the jobs were sufficiently high level enough to warrant a regional or national search. It was too expensive to run ads in the big major national newspapers, plus professional and academic journals. Technology today has taken away the cost incentive to do more narrow searches, hence the spigot is always open. And it has made them lazy. It is apparently easier to re-post the job every few months or each time there is a vacancy rather than go back to the people who applied to previous postings. What is the worst that can happen? HR or the hiring manager calls someone who previously didn’t make the cut to be interviewed, or who was a second or third choice. 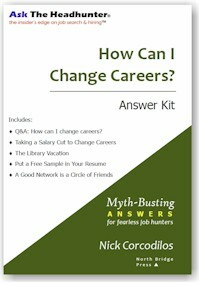 The worst answer HR could get is “Thank you, but I’ve found another job and I’m no longer interested in the position”. But you never know–maybe the second runner up is still interested, but when HR makes assumptions and doesn’t bother, then both parties are missing out, though I’m not sure this is a bad thing for the candidate. If HR is that nutty and that careless, then maybe it isn’t such a great place to work. Or maybe it is just HR, and the job and manager are great. The initial canned rejection is just a typical example of an online application having been “rejected” without even having been looked at, must less considered. The comments that Nick highlighted, from the HR people who had chimed in on the LinkedIn post are far more damning of the HR “profession” and better illustrate why HR should be removed from the selection and hiring processes. It’s bad enough that HR has set up the ATS processes and reject the majority of applications without looking at them. But the HR people who commented and piled on to call the cover letter “immature” and “childish” instead revealed how worthless HR is even when they DO look at something. Why? Because the applicant was a professional in the creative development and advertising field and he was applying for a CD/advertising position. In that context, the cover letter was not at all snarky, immature, or childish, but actually quite fitting for the position in question. I’m not an advertising guy, but I think it’s safe to say the part of advertising is (or can be) to get people’s attention and get them to read, listen, or watch further. Bait the target audience, and then hook them with the message. I would not be qualified to judge somebody’s portfolio and would never presume that I should try to do so. 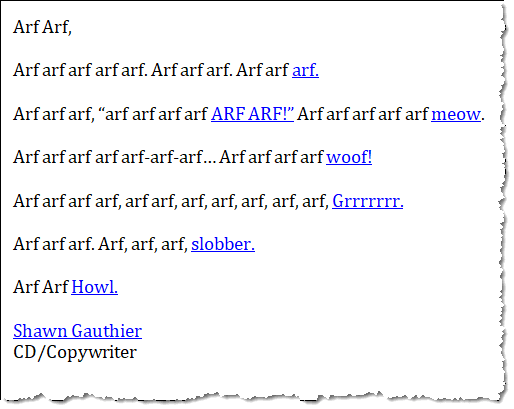 But I at least “get” that this cover letter was very appropriate, even if it required the reader to click on a link. And then if they liked what they saw on the first link, they might try the second one, and so on. (I would have gone for the “meow” first, being a cat guy.) The fact that some HR “professionals” looked at the cover letter and saw fit to disparage it and the writer, is simply a classbook example of why HR should never be allowed to handle hiring for any function other than their own species. IMO, HR is a self-important group; personal experience has shown them to be pretty ruthless and deceptive. Of course they wouldn’t find the cover letter funny, they are too busy doing SERIOUS work! Don’t waste their time! There really needs to be a complete re-tooling of the HR function, where payroll and benefits are their ONLY tasks. Recruiting obviously is not a successful endeavor when they need to rely on ATS and other systems that seemingly “overwhelm” them with too many of the “wrong” people. I found a brief clip of rapper Lil Jon on YouTube (What, Yeah, and Okay). I generally ignore the automated employment calls. When I have a moment, I have some fun and play parts of the clip to answer their questions. Q:Are you looking for a job that pays $20/hour? Q:Do you have X training? Sometimes I tell them that I have to check with my parole office first (My worst offense was a traffic ticket 20+ years ago). That ends the conversation quickly. This is so timely. Just yesterday I was reading a post on another blog that was about a well qualified candidate being treated poorly by a company. An HR person commented that the candidate shouldn’t take it personally, there was probably someone already pre-selected for the position. The implication seemed to be that someone internally was being hired and HR was just going thru the motions of interviewing people in order to cover themselves (my polite way of putting it). I was amazed that the HR person was actually admitting this. Never mind that you are wasting people’s valuable time. 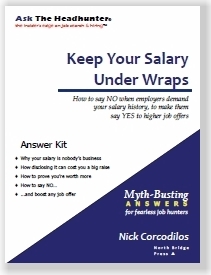 Nick, in my opinion, the methods you have been suggesting all these years are the most effective and professional way of going about employment. That you need to continue to preach this message just goes to show a lot of companies still aren’t getting it. Finding good employees and retaining them is hard work and most companies don’t seem to want to expand the time and effort doing that. 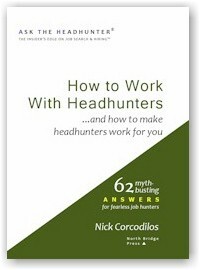 @Suzie: Thanks for your kind words about Ask The Headhunter. I stay in business because HR proliferates. When the person at fault proudly proclaims that the error of their ways is the standard, you know the system is entirely corrupt. Nick, what is the best way of taking control of an interview when the notorious game-playing questions are asked? I just started reading your site recently and haven’t seen this addressed (you do allude to the questions making for a fake interview above). I’m tempted to respond that they could have at least brought in a psychiatrist’s couch for greater comfort. If they were good sports, wouldn’t the employers disclose their own weaknesses first? I had an interview the other day and the hiring manager asked that question (with her boss and two staffers also present). Is it fair play to ask the manager to tell me in front of her boss what her great weakness is? If answered honestly, it must in some way hurt her job performance. The interviewers sometimes appear to be practicing medicine without a license. Thanks-I enjoy your advice. I believe that’s the crack of daylight needed to attempt to steer the interview in a different direction and use some of Nick’s advice. Even the salesmen who sold me cars these past 30 years didn't resort to such lying. @Sigh: Thanks for pointing out that comment on my NewsHour column. 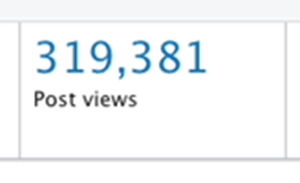 I missed it and now comments are closed (something I’ve complained about to NewsHour loudly). I may use that in an upcoming column. I wish the ceos, managers, and recruiters at every company in America would read this, and institute the changes that are necessary to fix this flawed process; wishful thinking. Whether you like HR or not, there are reasons it exists, one of which is to protect the company from discrimination complaints by making sure the company doesn’t discriminate on any basis other than the requirements of the job. As a headhunter you might be able to get away with this kind of I’ll-only-invite-the-good-ones approach, but if you’re in a company of any non-trivial size, it’s asking (make that *begging*) for trouble. @Bill: Points taken. But none of what you elaborate on explains or justifies the inexcusable, un-businesslike, counter-productive, disrespectful and frankly stupid behavior of HR. EEOC rules can be respected while an organization recruits intelligently and defensibly. The crap we see coming out of HR is inexcusable and indefensible. Nice try, but a lecture about the law does not address all the other problems we’re discussing here. Tell you what — if your concerns are about violations of EEOC regulations, let’s turn recruiting over to corporate legal departments. Because HR seems to largely use “regulations” as a transparent excuse to behave inexcusably. The point of disagreement is the idea that somebody in HR could become “expert” in the work without having either the education or hands-on experience, especially they will have control over who the hiring manager is allowed to interview. Can somebody who hasn’t done the work truly judge the candidates who have, or substitute their judgement for that of the hiring manager? In my mind, HR needs to be taken out of the hiring process completely (or almost completely, to the level that they merely serve to provide advisory support to the hiring managers). That said, anybody who is in the role of recruiting certainly should–or must–do the things you mentioned: gain as much knowledge as you can and get out there and talk to the professionals (in the sense of them talking shop, and not whining about a perceived talent gap). I’m a big believer in self-education, so I’m not going to dismiss the idea that somebody without the education or hands-on experience can become quite knowledgable on a subject. HR must be cut out and leave it to the hiring managers. But what about independent recruiters and headhunters? Can they become knowledgable enough to judge candidates? I think so, but it takes time, and the type of work you’ve mentioned for someone to immerse themselves enough that they can talk shop, even if they’ve never been in that shop.